It will be a battle of two former Duke point guards in the championship game of the FanDuel Legends Classic at Barclays Center on Tuesday. Marquette, led by head coach Steve Wojciechowski, opened semifinal action with an 81-80 win over No. 22/17 LSU. Trailing 80-79 after a Ben Simmons layup with 21 second to play, Jajuan Johnson sank a pair of free throws with 11 second left to put the Golden Eagles ahead 81-80. LSU’s Jalyn Patterson missed a three-pointer at the end of the game as Marquette held on to advance to the title game. 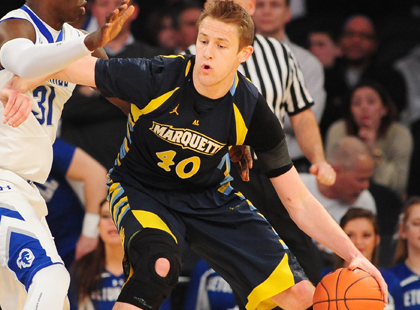 Luke Fischer led Marquette with 19 points and eight rebounds. Johnson, Henry Ellenson, and Duane Wilson each scored 16 points with Ellenson hauling down a team-high 11 rebounds. LSU was led by Simmons who posted 21 points, 20 rebounds, and seven assists. Tim Quarterman had 20 points, Antonio Blakeney scored 14 points, and Brandon Sampson added 10 points. Marquette will face Arizona State, guided by first-year head coach Bobby Hurley, as the Sun Devils captured a 79-76 victory over NC State. In a game that featured 10 lead changes, Arizona State got 21 points and 16 rebounds from Savon Goodman and 22 points from Tra Holder. Gerry Blakes posted 13 points and six rebounds and Eric Jacobsen had 11 points and six rebounds. Cat Barber led NC State with 22 points, six rebounds, and eight assists. Maverick Rowan closed the day with 14 points, Caleb Martin had 12 points, and Abdul-Malik Abu and Cody Martin had 10 points each. In Subregional Round play at Kennesaw State, the host Owls will face Belmont for the title. Kennesaw State earned a 77-65 win over IUPUI, led by the 19-point effort of Yonel Brown. Belmont received a career-high 30 points from Evan Bradds in taking a 98-85 decision from South Alabama. Tuesday will begin at 3:00pm (ET) with the South Alabama-IUPUI consolation contest, followed at 5:30pm with Belmont meeting Kennesaw State.